Aside from interesting ephemera and useful tools like the Signagraph, Waterman created some other handy items. The Waterman 20S was a prohibition era flask from the 1920s. It was supposed to look exactly like a Safety Pen, but was an innovative and sneaky rubber flask! Considering the average size of other vintage pens, the Waterman 20S was comparatively huge. Below, the Waterman 20S next to a Waterman 420 and Waterman 20. I have a Waterman 20 S Safety Pen. I have been told by one person bidding on my pen that it appears to be the Prohibition Flask. How do I tell the difference. I do not have a nib for it and acquired it from a person I did not know. It was included with some misc.items. Any information you can provide is appreciated. I could send a picture as well. Hello Gary, Thank you for your response. I believe it is the flask. Would this be more valuable than the pen? Hello Lorraine, to the right collector, it certainly could be. 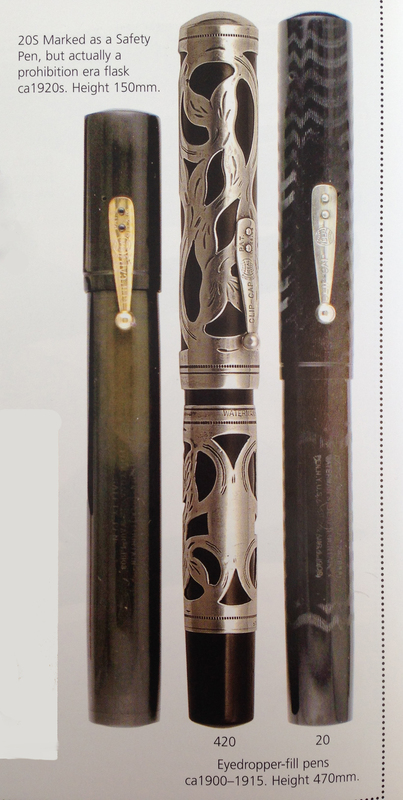 Many collectors don’t want what we consider “ephemera” but only want the actual pens. But the flask has an aura of its own since it’s a wonderful part of American history. Just think of how risqué the user would have felt with a flask full of booze in his shirt or jacket pocket, fooling the authorities at every step! Thank you so much. You have been very patient in answering all my questions. Your exceptional knowledge has been invaluable to me and very educational as well. I see a small seam at the bottom but it is not a turning knob. So that answers the question.